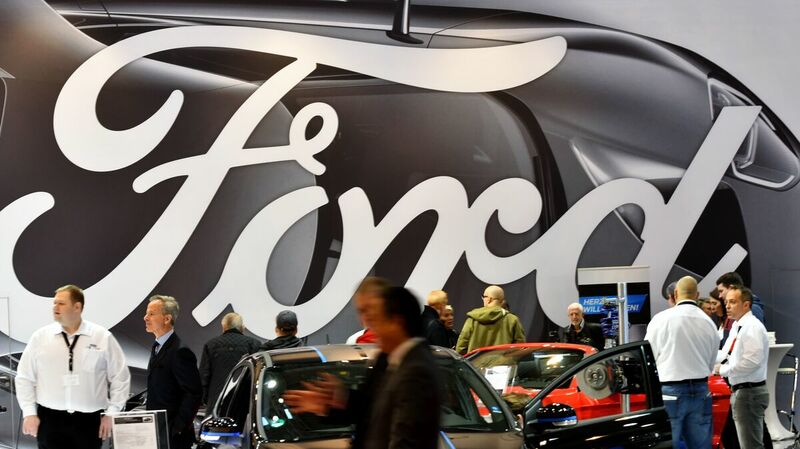 Ford Cutting Jobs In Europe, Moving Away From Less Profitable Vehicles The automaker says it is not yet clear how many people will lose their jobs. The cuts come during a time of turmoil for the car industry, as automakers invest heavily in new technology. People at the Ford display at the Essen Motor Show fair in Essen, Germany, in December 2017. The automaker has announced it will be cutting some jobs in Europe to reduce costs. Ford Motor Co. is cutting jobs in Europe and backing away from less profitable models as part of a major restructuring effort, the company announced Thursday. It's the latest sign of big changes in a global auto industry. The company will stop production at a plant in Bordeaux, France, which makes automatic transmissions. Ford is also in talks with worker groups over the possibility of eliminating the production of two small minivan models currently manufactured in Germany. "The plan will result in fewer jobs — both hourly and salaried — but it is premature to speculate on how many as we have just begun discussions with our Works Council and union partners," a company spokeswoman said in a statement. The automaker employs approximately 54,000 people in Europe. Jaguar Land Rover, in the U.K., also announced on Thursday it would be eliminating 4,500 jobs as part of a cost-cutting effort. Tim Urquhart, a principal automotive analyst at IHS Markit, says Ford has experienced "a very difficult market environment" in Europe, facing pressure from premium carmakers and more affordable brands. Luxury brands like Audi, BMW and Mercedes-Benz are offering smaller vehicles that appeal to a wider range of consumers, he says, while budget options like Hyundai and Kia are growing in popularity among price-conscious Europeans. "I call companies like Ford ... the squeezed middle," Urquhart says. "They're being squeezed from both angles." New emissions regulations in the European Union are also posing a challenge for automakers, while Britain's pending exit from the EU is causing uncertainty for the industry. And consumer tastes in Europe — like in the United States — are shifting away from cars and toward crossovers and small SUVs. But it's not just the perils of the European marketplace. Ford's cost-cutting measures are also responding to global trends, says Jessica Caldwell, the executive director of industry analysis at Edmunds. Ford is in the midst of a massive, worldwide restructuring effort, and General Motors has also announced layoffs and plant closures in recent months. Caldwell says both companies have invested heavily in developing self-driving cars and electric and hybrid vehicles. "They're looking globally and trying to figure out, 'How can we streamline production, cut costs, so we can invest in this new venture that we haven't had to invest in before?' " she says. Many automakers are also bracing for an expected slowdown in global demand for cars, Caldwell says. On Thursday, an auto industry group in China announced that car sales in that country declined in 2018, the first time in decades.